Edinburgh's first gourmet steak restaurant, in The Rutland Hotel at Edinburgh's West End, boasting enviable views of Edinburgh Castle. We use cuts from pedigree Aberdeen Angus to bring our customers the best possible steak experience. 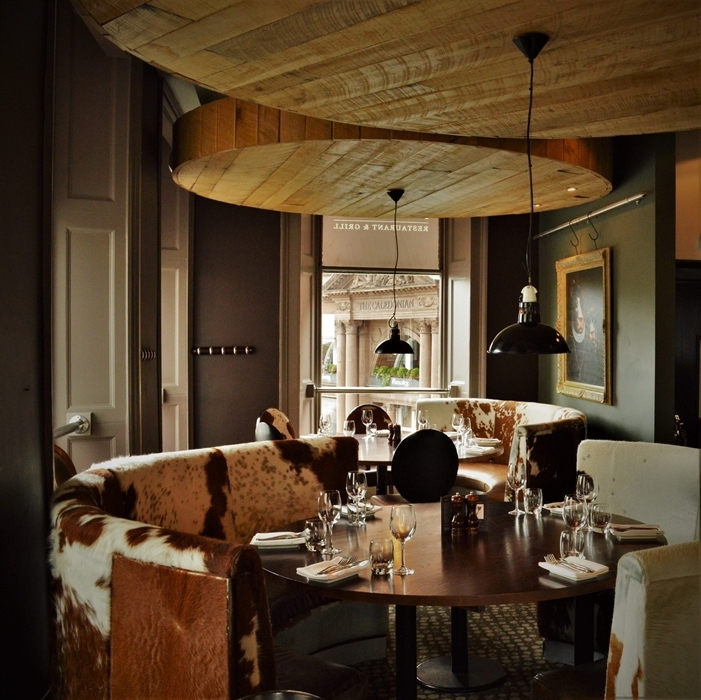 Kyloe Restaurant and Grill is a multi award winning steak restaurant housed within the reknowned Rutland Hotel in Edinburgh's City Centre. One of the first to embrace the gourmet steak trend, it burst on to the dining scene in 2010 and has built a steady base of fans and patrons resulting in a bustling restaurant with great food, atmosphere and first class customer service. Not just a steak house! The menu consists of local produce for the steak and a la carte menus as provenance is crucial to the ongoing success of this venture. When selecting suppliers, Kyloe's head chef John Rutter not only looks for a fantastic product but for suppliers who take provenance seriously. Using a selection of traditional and some more unusual cuts chosen for their texture and flavour, John has created an innovative Grill Menu. This is complemented by a robust a la carte menu which features Scottish seasonal produce, responsibly sourced and simply prepared to create a series of compelling dishes, including a tasty shellfish section and mouth-watering desserts and homemade ice creams created by our in-house pastry chef. Our unique and interesting wine list has been sourced through numerous wine merchants and features Kyloe's signature wine 'Angus the Bull', a South Australian Cabernet Sauvignon which is the ideal complement for your steak. An ideal accompaniment to red meat is malbec. Kyloe now boats a robust selections of Malbecs.